Volunteers on a Derbyshire heritage railway plan to hold an overnight vigil in a signal box to commemorate the centenary of a train disaster. The signal box at Butterley Station was formerly situated at Ais Gill - the site of a crash between two locomotives on 2 September 1913. Sixteen people died in the crash on the Settle to Carlisle line. The Midland Railway Trust, which is holding the event, said the disaster led to important safety changes. The vigil will take place on Sunday night. 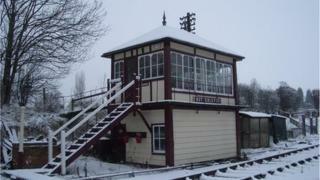 Alan Calladine said the trust, a registered charity, had bought the signal box and moved it to its current location in the 1980s, after it was closed by British Rail. "The Ais Gill disaster was a major accident in which a number of lives were lost," he said. "Lessons were learned from it in terms of rail safety." He said these had included new safety regulations for drivers, signalmen and guards, as well as a phasing out of gas and oil lighting on trains, which led to a fire breaking out on the train that night. The accident happened just after 03:00 when a passenger train, travelling from Carlisle to St Pancras, stalled at Ais Gill, the highest point on the line. The driver of the second train, following the same route, missed signals warning him not to proceed and crashed into the rear coaches of the stalled train. Around 38 people were seriously injured. "About half a dozen of us will be staffing the signal box overnight and reflecting on what happened 100 years ago," said organiser Alex Gibson, a director with the trust. "It was a significant accident in that it helped create the safety culture we see on the railways today. "The Ais Gill signal box was ahead of the accident and was the place where it was first reported."